Say you've got a big ole' list of gameable things - like from a blog post, pdf, or personal document. 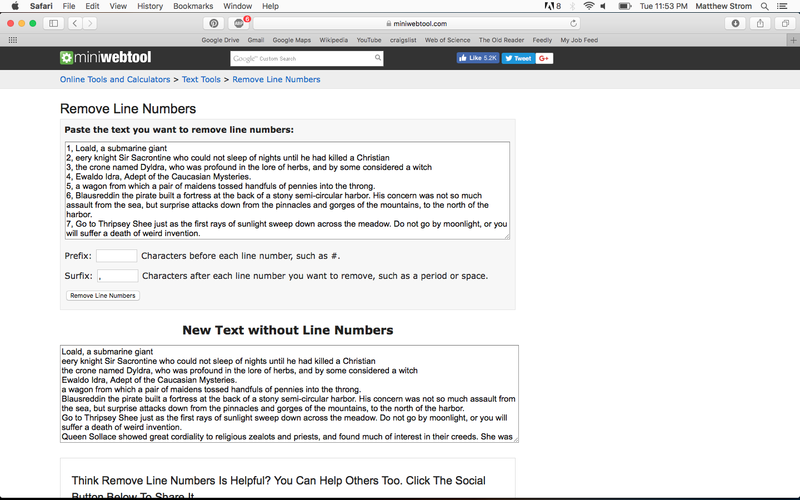 You're just dying to add to the Hex Describe Bible, but the thought of putting 100-plus entries in the right format is making your eyes glaze over. Don'a worry, Lucy! 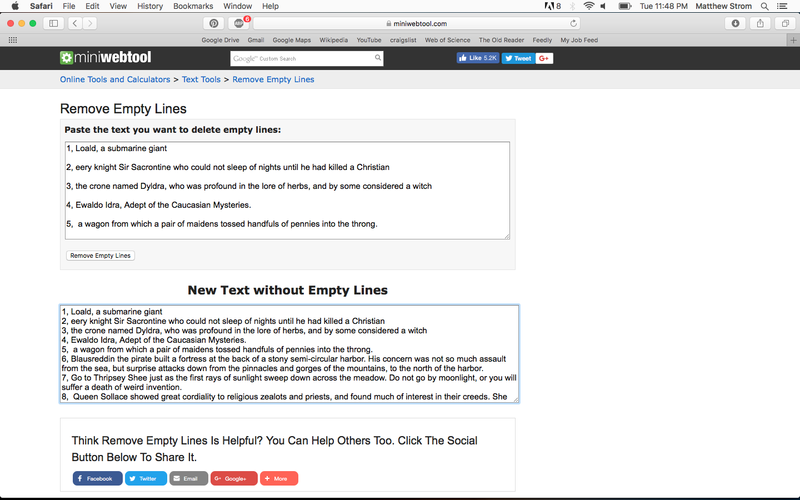 I found a collection of text-manipulation tools that can do it for you in seconds. Right now I want to add the entries in this post to the Bible. Can't go wrong with Vance, right? The problem is it's not in the right format. The first problem is that there's blank lines between each entry. I can remove those with a tool called "Remove Empty Lines." Just paste the text into the top box, click the button, and it shows up fixed in the bottom box. The next thing I want to do is remove the entry numbers to get ready to add the weights that Hex Describe expects. 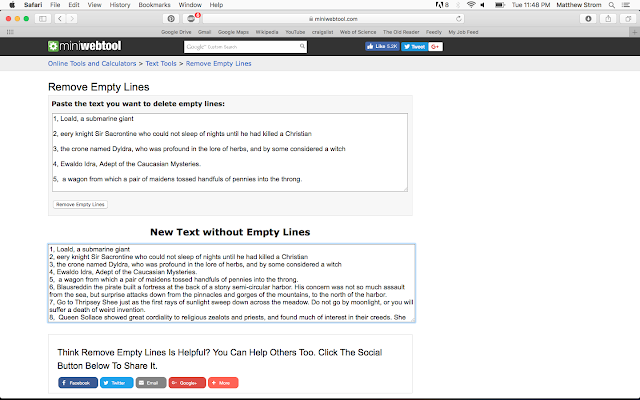 There's a tool called "Remove Line Numbers" for that. You can also specify a prefix or suffix to remove before or after the number. I specified to remove the comma and space that follows each number. The last thing to do is just to add the number 1 and comma to the beginning of each entry, so we'll go to the tool "Add Prefix and Suffix to Text." Paste the corrected text into the top box, specify the prefix as "1," and click the button. 1,Ewaldo Idra, Adept of the Caucasian Mysteries. 1,a wagon from which a pair of maidens tossed handfuls of pennies into the throng. 1,Blausreddin the pirate built a fortress at the back of a stony semi-circular harbor. His concern was not so much assault from the sea, but surprise attacks down from the pinnacles and gorges of the mountains, to the north of the harbor. 1,Go to Thripsey Shee just as the first rays of sunlight sweep down across the meadow. Do not go by moonlight, or you will suffer a death of weird invention. 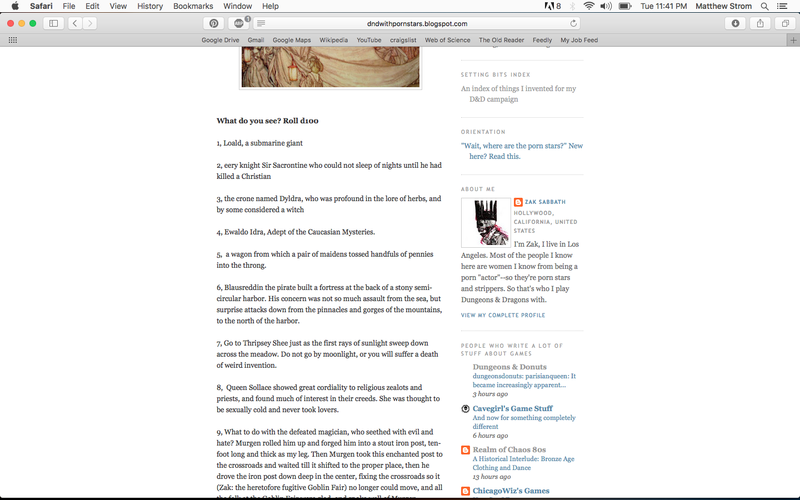 1,Queen Sollace showed great cordiality to religious zealots and priests, and found much of interest in their creeds. She was thought to be sexually cold and never took lovers. 1,"Well then, it's the place and time when the halflings and men can meet and none will harm the other, so long as he stays polite. 1,books of fairy-skein, written with words that you can't get out of your head once they're in. 1,*A unit of acrimony and malice, as expressed in the terms of a curse. 1,Dame Boudetta, Mistress of the Household, a severe and uncompromising lady, born into the petty gentility. Her duties were manifold: she supervised the female servants, monitored their virtue, arbitrated questions of propriety. She knew the special conventions of the palace. She was a compendium of genealogical information and even greater masses of scandal. 1,Prince Quilcy, is feeble-minded and spends his days playing with fanciful dolls and doll-houses. 1,Hall of Honors beyond, where fifty-four great chairs, ranking the walls to right and left, represented the fifty-four most noble houses of Lyonesse…One chair was characterized by a shifting sidelong deceit, but pretended graceful charm; another exhibited a doomed and reckless bravery. 1,King Oriante, a pallid round-headed little man, was ineffectual, shrill and waspish. He reigned at his castle Sfan Sfeg, near the town Oaldes, but could not rule the fiercely independent barons of mountain and moor. His queen, Behus, was both tall and corpulent and she had borne him a single son, Quilcy, now five years old, somewhat lack-witted and unable to control the flow of saliva from his mouth. 1,They wore long robes of brown furze, belted and hooded to hide their faces, and each carried an oak branch from their sacred grove. 1,…caught a mouse and changed it into a fine horse. 'Ride home at speed,' he told me. ";Do not dismount or touch the ground before your destination, for as soon as your foot touches ground, the horse is once more a mouse! 1,King Casmir now dispatched a secret emissary to Dascinet, urging attack upon Troicinet, and promising full assistance. 1,On the rocks west of the Chale crawled cripples, lepers and the weak-minded, in accordance with the statutes of Lyonesse. 1,Each was spread-eagled naked to a frame and hung upside down, facing out to sea. Down from the Peinhador came Zerling, the Chief Executioner. He walked along the row, stopped by each man, slit the abdomen, drew out the intestines with a double-pronged hook, so that they fell over the chest and head, then moved on to the next. 1,…green glass bottle of a size to hold a gallon. The mouth fitted tightly about the neck of a double-headed homunculus, so that only its two small heads protruded. These were squat, no larger than cat-size, with wrinkled bald pates, snapping black eyes, a nose and oral apparatus of tough brown horn. The body was obscured by the glass and a dark liquid, like strong beer…"Let the bottled imps clamp your hair or your fingers and you will learn the meaning of harm." 1,an octagonal mirror in a frame of tarnished wood…I see nothing. It is like looking into the sky." 1,The surface of the mirror moved; for an instant a face looked into her own: a man's face. Dark hair curled down past a flawless complexion; fine eyebrows curved over lustrous dark eyes; a straight nose complemented a full supple mouth.. .The magic faded…From time to time I demonstrate the inconceivable, or mock the innocent, or give truth to liars, or shred the poses of virtue—all as perversity strikes me. now I am silent; this is my mood." 1,…trained animals, which King Casmir had ordained for his pleasure. Bears in blue cocked hats tossed balls back and forth; four wolves in costumes of pink and yellow satin danced a quadrille; six herons with as many crows marched in formation. 1,…the Skyls, a dark crafty race of unknown origin, were uncontrollable. They lived isolated in mountain glens, emerging only when the time came for dreadful deeds. Vendetta, revenge and counter-revenge ruled their lives. The Skyls' virtues were stealth, reckless elan, blood-lust and stoicism under torment; his word, be it promise, guarantee or threat might be equated with certainty; indeed the Skyl's exact adherence to his pledge often verged upon the absurd. From birth to death his life was a succession of murders, captivities, escapes, wild flights, daring rescues: deeds incongruous in a landscape of Arcadian beauty. 1,Five golden crowns rolled forth. They became five golden butterflies which fluttered into the air and circled the parlor. The five became ten, twenty, fifty, a hundred. All at once they dropped to cluster upon the table, where they became a hundred gold crowns. 1,A cavalcade of twenty knights and men-at-arms came down the Sfer Arct and into Lyonesse Town. At their head rode Duke Carfilhiot, erect and easy: a man with black curling hair cropped at his ears, a fair skin, features regular and fine, if somewhat austere, save for the mouth, which was that of a sentimental poet. 1,A great lummox claims that you have molested his wife; he takes up his cutlass and comes at you. 1,swan-headed barge, which a dozen young girls clad in white feathers propelled slowly across the lake. 1,They breed and train the cannibal falcons, each a traitor to his kind. 1,a tall shape muffled in a long black cape, with a wide-brimmed black hat obscuring his features. He stood always back in the shadows and never spoke; when one or another of the magicians chanced to look into his face they saw black emptiness with a pair of far stars where his eyes might be. 1,the Spell of Total Enlightenment, so that Widdefut suddenly knew everything which might be known: the history of each atom of the universe, the devolvements of eight kinds of time, the possible phases of each succeeding instant; all the flavors, sounds, sights, smells of the world, as well as percepts relative to nine other more unusual senses. Widdefut became palsied and paralyzed and could not so much as feed himself. 1,He was compressed into an iron post seven feet tall and four inches square, so that only upon careful scrutiny might his distorted features be noted. This post was similar to the post at Twitten's Corner. The Sartzanek post was implanted at the very peak of Mount Agon. Whenever lightning struck down, Sartzanek's etched features were said to twitch and quiver. 1,In niches beside the entrance stood a pair of sphinxes carved from blocks of black diorite: the Tronen, or fetishes of the house. 1,A griffin's claw reposed in an onyx case. 1,A gallstone cast by the ogre Heulamides gave off a peculiar stench. 1,Persilian, the so-called "Magic Mirror." This mirror would answer three questions to its owner, who then must relinquish it to another. Should the owner ask a fourth question, the mirror would make glad response, then dissolve into freedom. 1,This feather," he said, "is indispensable to the conduct of daily affairs, in that it infallibly detects fraudulence." 1,a young harpy in a cage. 1,Desmei moved away. Presently she departed through the forest in a palanquin carried by six running shadows. 1,The cow's horn yields either fresh milk or hydromel, depending upon how one holds it. 1,a green meadow where rose an array of twenty poles, half supporting impaled corpses. 1,I am a student of magic. I am taught by the great Tamurello, and I am under obligation, so that I must refer to him matters of policy. 1,Balberry's Abstracts and Excerpts, a vast compendium of exercises, methods, forms and patterns inscribed in antique or even imaginary languages. 1,Using a lens fashioned from a sandestin's eye, Shimrod read these inscriptions as if they were plain tongue. 1,fairies of Tuddifot Shee, at the opposite end of Lally Meadow, who loved music, though no doubt for the wrong reasons. 1,Fairy musicians, discovering that a human passerby had chanced to hear them, invariably inquired how he had enjoyed the music, and woe betide the graceless churl who spoke his mind, for then he was set to dancing for a period comprising a week, a day, an hour, a minute and a second, without pause. However, should the listener declare himself enraptured he might well be rewarded by the vain and gloating halfling. 1,On certain occasions fairy horn-players asked to play along with him; each time Shimrod made polite refusal; if he allowed such a duet he might find himself playing forever: by day, by night, across the meadow, in the treetops, higgledy-piggledy through thorn and thicket, across the moors, underground in the shees. The secret, so Shimrod knew, was never to accept the fairies' terms, but always to close the deal on one's own stipulations, otherwise the bargain was sure to turn sour. 1,To the side a long-bearded troll, with an extravagantly large cudgel, beat a lank furry creature hanging like a rug on a line between a pair of trees. With every blow the creature cried out for mercy: Stop! No more! You are breaking my bones! Have you no pity? You have mistaken me; this is clear! My name is Grofinet! No more! Use logic and reason!" 1,He placed down a small box, which expanded to the dimensions of a hut. 1,…the severed member. Rings decorated the four fingers; the thumb wore a heavy silver ring with a turquoise cabochon. An inscription mysterious to Shimrod encircled the stone. 1,In the forest nearby a door opens into the otherwhere Irerly. One of us must go through this door and bring back thirteen gems of different colors, while the other guards the access. 1,isolated mountains of gray-yellow custard, each terminating in a ludicrous semi-human face. All faces were turned toward himself, displaying outrage and censure. Some showed cataclysmic scowls and grimaces, others produced thunderous belches of disdain. The most intemperate extruded a pair of liver-colored tongues, dripping magma which tinkled in falling, like small bells; one or two spat jets of hissing green sound, which Shimrod avoided, so that they struck other mountains, to cause new disturbance. 1,you will need this sheath. It is stuff to protect you from emanations. 1,three competing religions: The Doctrine of Arcoid Clincture; the Shrouded Macrolith, which I personally consider a fallacy; and the noble Derelictionary Tocsin. 1,Shimrod brought the House Eye down from the ridge-beam, and set it on the carved table in the parlor, where, upon stimulus, it recreated what it had observed during Shimrod's absence. 1,On the great table he found a silver penny, a dagger and a small six-stringed cadensis of unusual shape which, almost of its own accord, produced lively tunes. 1,BOAB: who used the semblance of a pale green youth with grasshopper wings and antennae. He carried a black quill pen plucked from the tail of a raven and recorded all the events and transactions of the tribe on sheets pressed from lily petals. 1,TUTTERWIT: an imp who liked to visit human houses and tease the cats. He also liked to peer through windows, moaning and grimacing until someone's attention was engaged, then jerk quickly from sight. 1,GUNDELINE: a slender maiden of enchanting charm, with flowing lavender hair and green fingernails. She mimed, preened, cut capers, but never spoke, and no one knew her well. She licked saffron from poppy pistils with quick darts of her pointed green tongue. 1,WONE: she liked to rise early, before dawn, and flavor dew drops with assorted flower nectars. 1,MURDOCK: a fat brown goblin who tanned mouseskins and wove the down of baby owls into soft gray blankets for fairy children. 1,FLINK: who forged fairy swords, using techniques of antique force. He was a great braggart and often sang the ballad celebrating the famous duel he had fought with the goblin Dangott. 1,SHIMMIR: audaciously she had mocked Queen Bossum and capered silently behind her, mimicking the queen's flouncing gait, while all the fairies sat hunched, hands pressed to mouths, to stop their laughter. In punishment Queen Bossum turned her feet backward and put a carbuncle on her nose. 1,FALAEL: who manifested himself as a pale brown imp, with the body of a boy and the face of a girl. Falael was incessantly mischievous, and when villagers came to the forest to gather berries and nuts, it was usually Falael who caused their nuts to explode and transformed their strawberries to toads and beetles. 1,Twisk, who usually appeared as an orange-haired maiden wearing a gown of gray gauze. 1,He assembled an orchestra of hedgehogs, weasels, crows and lizards and trained them in the use of musical instruments. 1,Falael, from boredom, next transformed Dhrun's nose into a long green eel which, by swinging about, was able to transfix Dhrun with a quizzical stare. 1,a fairy sword. "The name of this sword is Dassenach. It will grow as you grow, and always match your stature. Its edge will never fail and it will come to your hand whenever you call its name!" 1,a locket around his neck. "This is a talisman against fear. Wear this black stone always and you will never lack courage. 1,a set of pipes. "Here is music. When you play, heels will fly and you will never lack jolly companionship." 1,"This is a magic purse," she told him. "It will never go empty, and better, if you ever give a coin and want it back, you need only tap the purse and the coin will fly back to you." 1,"Go your way and do not look back, on pain of seven years bad luck, for such is the manner one must leave a fairy shee." 1,a clearing planted with plum and apricot trees, which had long gone wild. 1,Before the hall the ground had been tilled and planted with cabbage, leeks, turnips, and onions, with currant bushes growing to the side. A dozen children, aged from six to twelve, worked in the garden under the vigilant eye of an overseer boy, perhaps fourteen years old. He was black-haired and thick-bodied, with an odd face: heavy and square above, then slanting in to a foxy mouth and a small sharp chin. He carried a rude whip, fashioned from a willow switch, with a cord tied to the end.